The Unison Corporate cartridge life cycle, guided by the principles of zero waste and the circular economy, occurs entirely in the EU. 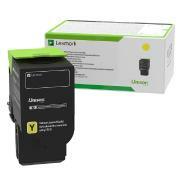 Driven by our commitment to corporate social responsibility and guided by the principles of zero waste and the circular economy, Lexmark’s A4 CS/CX and MS/MX Corporate Cartridges further advance the sustainability innovations delivered by the Unison toner print system. Its life cycle occurs entirely in the EU - from production to use to recovery and back again - providing social and environmental benefits to the local economy. Up to 5,000 standard pages in accordance with ISO/IEC 19798.